Female-fronted guitar rock with hooks and chops, Lesliwood, who leads this quartet, takes the band through jagged, rough, and raucous-filled mayhem, the guitars buzzing as the rhythm section keeps things loud and interesting. This is grrl-rock at its best, a more-than-capable line-up of fierce, powerful musicians who know what it means to rock, and demonstrate it on Ms. 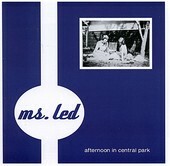 Led's Afternoon In Central Park. Equal parts punk rock and power-pop, the band screams along without losing a beat, even offering up a few slower, mid-tempo numbers to mix things up a bit. I'll give it an A-.